Pumps perform essential functions in a wide variety of industries, from drinking water distribution to wastewater collection, from large-scale heating and cooling facilities to small-scale biomedical applications. Within each of those applications, you will find an even wider variety of pump designs. Some are dynamic pumps—axial, centrifugal, and mixed-flow. Others are positive displacement pumps—progressive cavity, gear, lobe, rotary vane, screw, and piston. You can use CONVERGE to easily set up liquid flow simulations in any of these types of pumps. CONVERGE’s automated Cartesian cut-cell meshing approach also ensures the accuracy of your solution by allowing you to easily perform grid convergence studies. Creating a boundary-fitted mesh for a complex machine like an axial flow pump or a screw pump can be tedious and time-consuming if you use the traditional approach. Creating a mesh for a pump simulation in CONVERGE is simple and easy. Because of CONVERGE’s unique Cartesian cut-cell methodology, CONVERGE can automatically create a robust mesh for even complex pump impellers and in the tight clearances of a positive displacement pump. 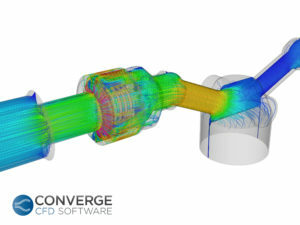 CONVERGE uses its Cartesian cut-cell approach to automatically generate a mesh for the full 360-degree pump geometry. 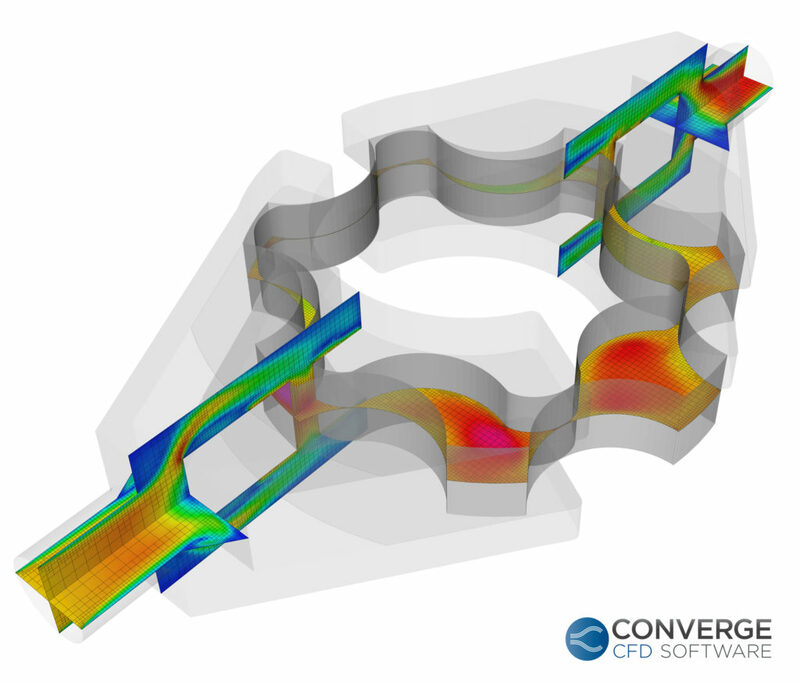 Because CONVERGE does not require a meshing template, it is an ideal tool for simulating unorthodox or innovative pump designs. Design is often an iterative process. The iterative nature of design is what makes modern computers so useful for this process. When you create a geometry for a pump, you want the ability to easily modify this geometry as you discover potential improvements. CONVERGE efficiently accommodates geometry modifications with its automatic meshing approach. When you change the geometry, no re-meshing is required before running another simulation. CONVERGE automatically generates the cut-cell mesh based on the new geometry. You can use CONVERGE’s multiple reference frame (MRF) approach to set up steady-state pump simulations that converge quickly. This is an ideal solution for efficiently creating pump curves or performance maps. You can use these pump curves to give yourself a good idea of how the pump will perform under different operating conditions and to find the peak efficiency. Sometimes, however, a steady-state answer is simply not good enough. 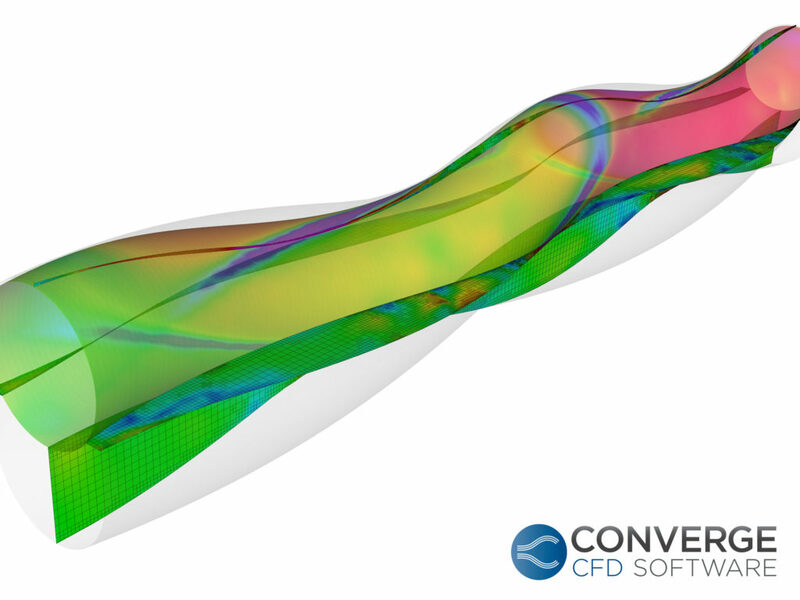 CONVERGE also offers transient simulations, which can provide valuable information about the flow characteristics of a pump. For example, pressure pulsations, impeller wear, and undesirable valve dynamics are all design issues best analyzed using transient flow simulations. Monitoring how the pressure imbalances change as the parts move in the pump is crucial to discovering necessary design improvements. CONVERGE’s transient flow analysis also offers you the ability to monitor the potential for cavitation and the effect of dissolved gas and fluid compressibility on pump performance. The setup process for a transient simulation is just as straightforward as it is for an MRF steady-state simulation, and CONVERGE’s Cartesian cut-cell meshing method means there’s no need to manually manipulate the mesh to accommodate how the boundary motion will stretch, deform, or overlap the stationary mesh. The ability to quickly set up and run transient pump simulations is also useful for understanding the motion of flow-driven valves using CONVERGE’s fluid-structure interaction model. Even near moving parts with unprescribed motion, CONVERGE automatically generates the mesh at each time-step to capture any arbitrary motion of flow-driven solids. True innovation means breaking the rules. If you have an idea for an innovative pump design, you likely won’t be able to use an existing pump as a meshing template. 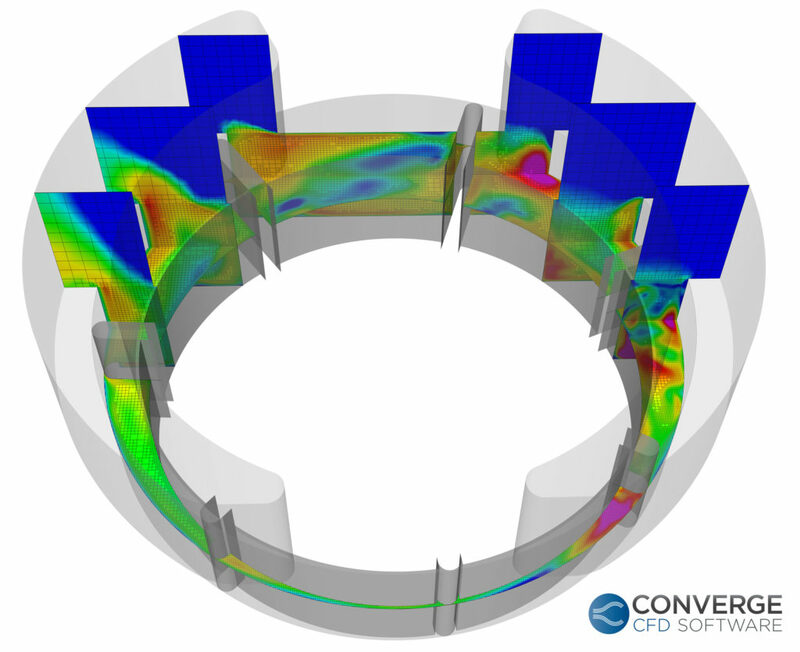 CONVERGE’s autonomous meshing makes it an ideal tool for designs that break the mold of conventional pump design. Choosing the mesh criteria is the same for any type of pump, whether it is a dynamic pump or a positive displacement pump. The mesh setup in CONVERGE is simple even for pumps with motion as complex as a pendulum slider or a diaphragm pump. A feature of CONVERGE that makes the case setup especially convenient is Adaptive Mesh Refinement (AMR). AMR automatically refines the mesh in locations where it is most needed (such as at vortex-shedding locations), only at the times it is needed. AMR not only makes the setup process simpler, but it also helps to reduce the run time of the simulation by capturing accurate flow results without a globally refined mesh. CONVERGE can simulate a wide variety of liquids (both Newtonian and non-Newtonian, compressible and incompressible) in your pump. To define your liquid, you can use CONVERGE’s liquid property definition or a custom fluid property calculator. If your goal is to create a better pump, CONVERGE is an ideal tool for understanding how the crucial details of your pump design affect its performance and durability. If you use a tool that is only capable of steady-state simulations, your designs naturally will be limited to those that can be modeled in a steady-state manner. Use CONVERGE to set your designs apart from the competition with valuable insights gained from accurate transient simulations.